Here's a cool game coming to GameCube in Japan, it's quite unlikely we'll get it in the West but who knows... in the meanwhile, check how you like it in this preview. - Unity, a mixture of shoot'em up and musical game has been announced for GameCube. It seems to be exclusive to the system, and is planned for a 2004 release. - Soul Calibur 2 is to be released on the same day as Product Number 03: March 27, 2003 in Japan ! - In Product Number 03, the main character Vanessa Z. Schneider, will now use laser beams coming out from her hands instead of guns. - According to IGN, Retro Studios has officially started to work on a new Metroid game, again... We hope it's not true, or at least that they have another project on the way, because it's time to introduce new things. With the experience acquired with Metroid Prime, why not resuming work on the promising Raven Blade ? - Factor 5 has 2 projects coming, but it's not certain yet if they are for GameCube. It's less thrilling than a pilgrimage game of course, but 8 new screenshots of Vanessa Z. Schneider (well, there's one of the boss of the first level) have been added. A VERY shocking new game for GameCube ! - Game for experiencing pilgrimage around Shikoku Island - Dojo for starting pilgrimage at Awa. 2 games which seem to be exclusive to GameCube, one is already released in Japan for some time now (Captain Tsubasa aka Olive et Tom in France) and the other one is coming next March starring everyone's favorite jumping blue robot ! Namco unveiled today some new characters for the fighting game Soul Calibur 2. One of them is Necrid, a huuuge green monster with a huuuuuger sword, designed by Todd McFarlane. The other character is dressed in green too, much more friendly to Nintendo fans' eyes, as the rumor foretold, it is Link from The Legend of Zelda. Here are the first big pictures (640x480 with no logos). New pictures of PN03 and Resident Evil 4 ! Say peepee-poopoo to the big video games sites, Samurai Nintendo got some new pictures of these 2 Capcom games before they do. Capcom published 18 new pictures. Some are VERY similar, I put only one picture when one group was too identical. It's still 13 pictures ! Enjoy, some are cool, especially for PN03. This girl rocks ! My most interesting comments (that's ironical) are not put yet, I'll write them next week. No time now. A release date for Megaman and PN03 ! Megaman EXE Transmission, the first Megaman on GameCube (and hopefully not the last one like on Nintendo 64...) will be released on March 6, 2003 while Product Number 03 will be out on March 27, 2003. All this in Japan, player-san ! 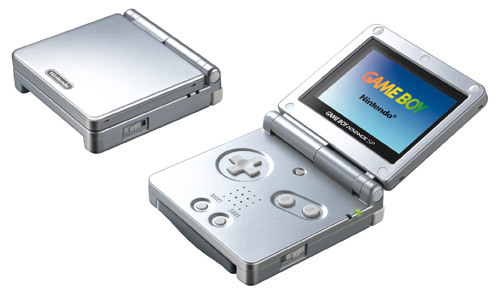 The New Game Boy Advance ! Samurai Nintendo is not what you can call a "big site", so we don't often receive impressions from our readers. Maybe because the big sites are closed for Christmas holidays, we got a few more mails than usual this month, including some opinions about Doshin The Giant, Starfox Adventures and the upcoming Final Fantasy Crystal Chronicles. The comments have been added to the review/preview of each game. Don't hesitate to express yourself too ! Happy New Year 200Cube ! 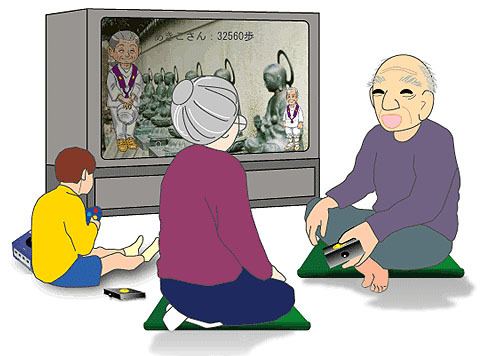 Samurai Nintendo wishes to all its readers and visitors a Happy New Year 2003 ! 2. Super Smash Bros. Melee >So much fun ! 5. Resident Evil >A delight of horror, the best of the "haunted house"
Of course, if you live in US or Japan, Animal Forest +, The Legend of Zelda and Metroid Prime should rank high in this top 10.